SUMMARY: Our G Series style of banner pen is attractive and comes in a range of varying colors at a great price point. Along with all the normal benefits of usefulness, longevity and economical cost associated with ‘normal’ promotional pens, the banner pens offer a great opportunity to display a far greater range of information on their unique banners and encourage interactivity with the customer in pulling the banners in and out. Printing: Professional full color print used on both sides of the scroll. This will enable the edge of your banner pen design to double as barrel printing for your logo when the banner is in the retracted position. By using a clear barrel, you won’t incur any additional printing or artwork preparation costs. 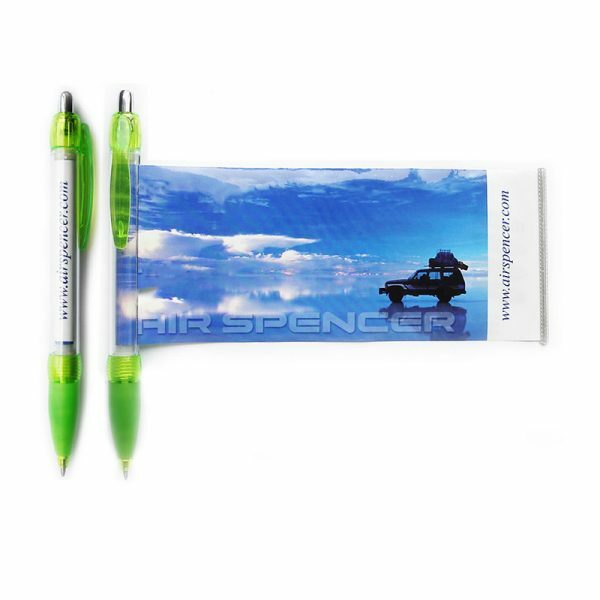 Our customized banner pen designs are digitally printed and as a result you can have detailed graphic images showing through on the body of the banner pens.